History is never as clean or as clear cut as the books make it out to be and for the survivors’ of the Boshin War and the pivotal Battle of Toba-Fushimi the scars run deep and the old hatreds have simmered. It is to be expected that the consequences of this battle are messier and farther reaching than many would like considering the conflict between the Tokugawa Shogunate and the eventually victorious Imperial forces decided the fate of Japan and set in motion the end of samurai era and ushered in the modernisation and westernisation of Japan. Many who fought on both sides found themselves cast adrift in a new world that does not require their deadly skills but these people who fought to change the future of their nation will find history can never be escaped. For Kenshin Himura (Satoh) this change is to be embraced and protected and ever since that battle he has tried to discard his old life. Once an elite government assassin whose skill with the blade made him a legend across Japan and helped secure the Imperial government’s victory, he has since worked hard to fade into the background having lain down his sword and renounced killing and embraced the life of a wanderer who helps others in order to atone for his past deeds. His own tragic childhood, tough upbringing, and memories of war fuel his desire to protect a new age of equality where people know nothing of war and children experience peace. It is a fragile peace and a somewhat dishonest one as another survivor of the battle of Toba-Fushimi knows all too well and this man threatens to burn the new Japan to the ground. That man is Makoto Shishio (Fujiwara). He is a skilled swordsman and a ruthless and merciless killer who was left physically scarred after a betrayal by his government paymasters at Toba-Fushimi. He was believed to be dead but is in fact both alive and plotting to overthrow the new government of Japan. Shishio is driven by a burning desire for revenge and commands a private army of mercenaries who are carving out a huge swathe of territory for their master while destroying all forces sent against them by the government. With few options left, Home Minister Toshimichi Okubo (Miyazawa) summons the only man alive who can stop Shishio… Rurouni Kenshin. After preventing a drugs-baron from flooding Japan with opium, Kenshin has started a new life and helps out in a dojo run by fencing instructor Kaoru (Takei). He enjoys life surrounded by his friends, Kaoru’s young student Yahiko (Oyagi), brawny roughneck Sanosuke (Aoki), and a formerly deviant and deadly doctor named Megumi (Aoi) who now uses her medical skills to help the local community. With a place to call his own in the new Japan and treading the path of nonviolence he is at peace and growing closer to Kaoru. When the government calls on Kenshin, their happiness is shattered. Despite some misgivings about helping and facing the possibility of breaking his pledge of non-violence, when he sees the destruction wrought by Shishio and his forces, he knows he must take up his sword once again and travel to Kyoto to stop Shishio and save Japan! Audiences will be relieved that he does take to fighting once again because it means another instalment in the live-action Rurouni Kenshin trilogy of films. Kyoto Inferno is the second I have seen in a cinema and it was a fantastic big blockbuster movie that I found so exciting I had to see it twice during its run! 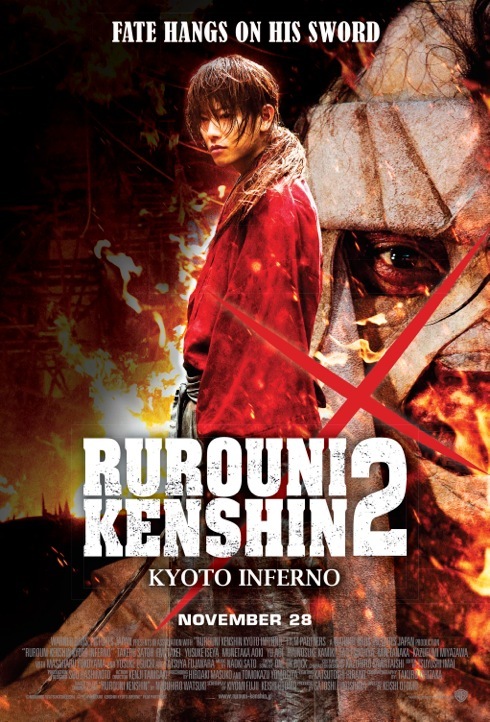 Kyoto Inferno is the sequel to the 2012 Rurouni Kenshin film and much like its predecessor it is based on and remains faithful to Nobuhiro Watsuki’s manga. 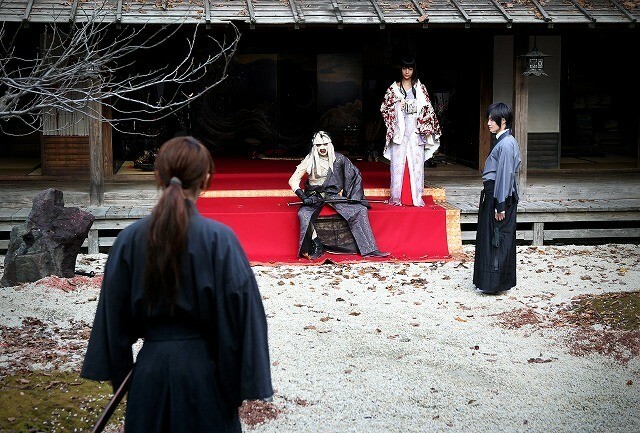 It adapts the Kyoto arc of Kenshin’s story which many fans consider to be the best part. If the first film served to lay the groundwork for historical context and character back-story, Kyoto Inferno is the series flexing its muscles just before the third and final part. Director Keishi Ohtomo, his production team and his cast returned from the first film less than a year after it was released and over the course of six months they made Kyoto Inferno back-to-back with the third film, The Legend Ends. The two were released in Japan last year in August and September respectively and became huge box-office smash hits. 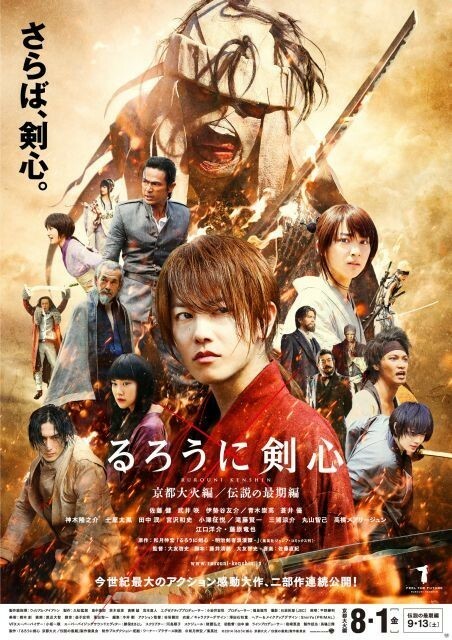 As the dramatic title suggests Kyoto Inferno has grand ambitions with a big budget (3 billion yen) a complex narrative that stretches across Japan and across history, a large cast (5,000 extras), and even more impressive sets, costumes, battles and visuals that have sheen of classiness thanks show the high production values on display. Once again we are transported into Japan’s recent past and it is this rich history and its real people and politics which gives the film enough depth and its characters enough complexity to make the film more than a simple action title. The historical context is rich here. Kenshin exists in an age where society is in flux, where samurai are no longer the bedrock and rulers of Japan, they now occupy liminal space and their fall from grace is the price to be paid for making Japan a modern nation where words like equality mean something. This change can be seen affecting everyone and everything on screen. Some samurai such as Hajime Saito, a former member of the Shogun’s Shinsengumi, have taken on new roles in society, donned western clothes and adopted western habits and joined the police and government as the new Imperial authorities simultaneously absorbs much of the samurai caste and outlaws the rest. Others have not fared so well with the changes and bands of rowdy ragged-clothed Ronin roam the country causing trouble that has to be put down by the new police force. Even a legendary assassin like Kenshin is cast adrift in the age he helped bring about but at the end of the first film he has found a way to live a life of peace. More worryingly, others such as Shishio are plotting to drag everyone back to the past, to an age where the strong rule the weak and men like him can prosper. A world opposite of the one Kenshin fights for. His ideology isn’t born from lazy scriptwriting and clichéd genre tropes, it is one driven by his own personal and complex nature, his almost psychopathic personality which refuses to bow down to anyone and would have flourished in an earlier age of constant warfare like the Sengoku period, a personality that is spurred on by the hypocrisy of the new government which was born on a tide of bloodshed orchestrated and performed by men like him, men that have subsequently been betrayed and discarded. This is most potently shown in a flashback to Shishio’s battle at Toba-Fushimi, shot distinctly differently from the grand and luscious main plot, it is a grainy and harrowing battle on a patch of blasted and snowbound countryside that looks like t is straight from a nuclear winter. The battle is full of jittery camera movement which displays his callousness and that of the Imperial government. Indeed, one of the great strengths of the film is the delivery of this rich back-story. You do not need to have a degree in Japanese history to understand any of this. It is all told in dialogue that is well-crafted and well-delivered to avoid sounding too much like crude exposition. It is all on display in the way characters interact and the costumes worn by them like dust-covered down and out Ronin, and well-heeled government men in western clothes and the increasing presence of foreigners. It is shown in the sets which recreate an age of change which we see while watching Kenshin journey across Japan. Kyoto Inferno brings to the screen scenes and locations, gorgeous outdoor sets that span the screen, props, and costumes that look to have been taken wholesale from the past via a time machine. They offer up a glorious feeling of verisimilitude that transport the audience into a fully populated living breathing world you could imagine actually existed and will continue to exist after the film has finished. Kenshin visits the new European style government buildings occupied by Home Minister Okubo which displays the change in the age. The homely dojo that Kenshin lives in with Kaoru in Tokyo has polished floors, orderly rooms, and small garden that all speak of peace and dedication to simplicity and the bettering the human spirit. Kyoto, Kenshin’s destination, is a more traditional bustling and thriving metropolis where Geisha in their full dress catch the eye of young Yahiko and street sellers offer windmills and other goods. A burnt out village that is a trap for Kenshin is a ghost town where ash floats on the air, blood paints walls, and corpses hang from trees, and it all shows the barbarity Shishio wants to bring to Japan. The dedication to bringing to life this world, its people and politics is admirable. It feels like being transported in time and Kenshin’s travels are a great way to deliver it! 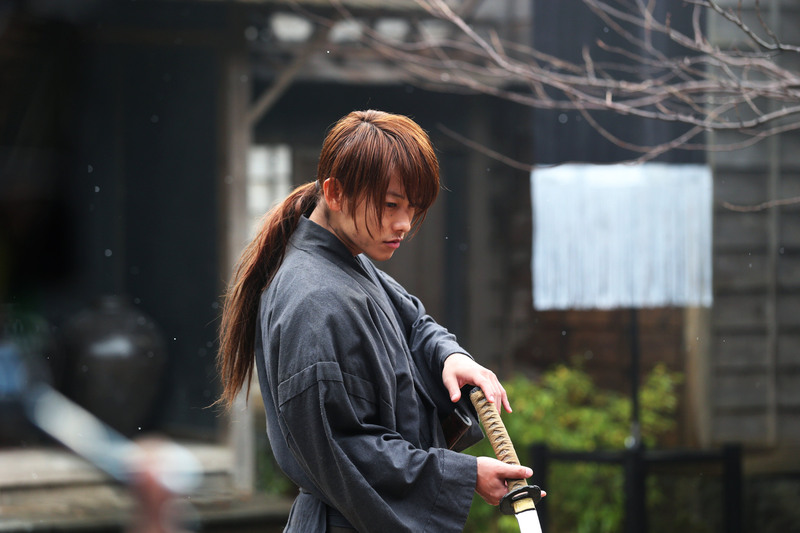 Playing the titular wandering swordsman is Takeru Satoh who offers another phenomenal physical performance full of fighting spirit. His compact frame belies the breath-taking speed, power, and athleticism that he has as he engages with a variety of opponents. 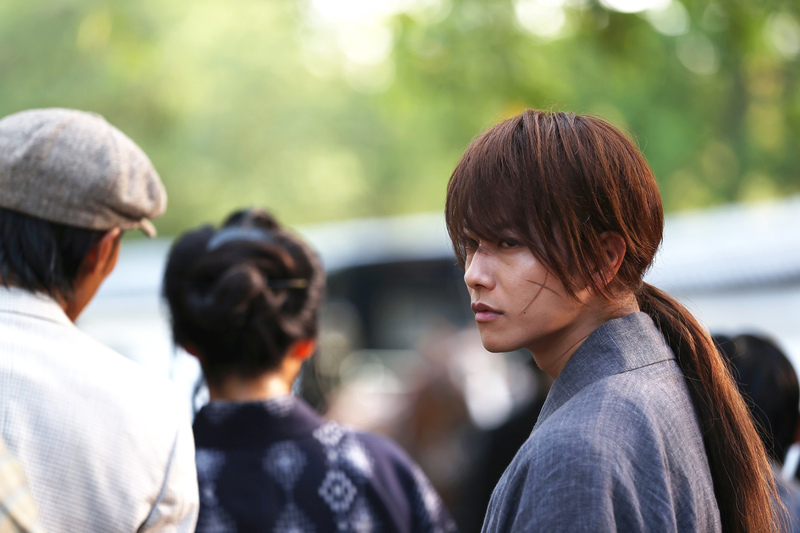 The fights are breath-taking to behold as Takeru Satoh, who performs in the majority of the battles, springs about the screen. One moment will see him rushing enemies stalking towards him in the blink of an eye and quickly changing direction to leap into a crowd of other samurai, his frame twisting around suddenly hand shooting out for guidance. His fighting technique is phenomenal and the clear and concise direction makes sure we see it. His sword is used for a few economical jabs, parries and thrusts to take down opponents quickly and efficiently, creating space and opportunity in battles so he controls the flow of battle. Even when he doesn’t have his blade, he is still an excellent fighter as he punches, kicks, throws and uses a hollow scabbard to beat an evil baby-snatching opponent and others. Few stand in his way. Few except Sojiro (played by Ryunosuke Kamiki), a baby-faced killer with quick reflexes and speed to rival Kenshin’s. The few encounters between Kenshin and Sojiro are short and sweet but phenomenal in terms of execution as they dash at each other, parry strikes, dodge, and tussle for any advantage and it offers a hint at the exciting blade storm to be expected in the third and final film. Ryunosuke Kamiki, an excellent actor who has been acting since he was a child but is still new to me (I first saw him in The Kirishima Thing) and while his malevolent character is only teased in this film, he has almost as much presence as Shishio as a villain. It is Takeru Sato who takes centre stage, however, and he manages to transcend his earlier, mostly physical performance, and put in a dramatically strong one which more clearly expresses Kenshin’s interior life as the legendary swordsman desperately battling against the need to kill his opponents and is taken to the limits of his pacifist pledge by some real tough guys. Every fight he takes on leaves not just its physical mark (darker clothes, rougher appearance), but a mental one, his countenance darkening with constant brooding over the importance of his task and wear of each battle leaving him more solemn as the film progresses. Given less to do are Kenshin’s old friends as a new, larger cast of characters are introduced but they do get some screen time. That written, a lot of the plaudits go to the new actors such as Tao Tsuchiya as Misao, a comely comedy ninja who offers levity to the film just before her heartbreak and Min Tanaka as , a veteran Watcher/ninja who gets involved in an amazing fight near the film’s end. Tatsuya Fujiwara resists creating a cartoonish antagonist despite the bandages and big speeches and reigns in a potentially melodramatic psycho performance to create a laconic bad guy who is intelligent, ruthless and as clear-eyed and honest about what he is doing and the age he lives in to be convincing as a leader of disenfranchised samurai. Fujiwara imbues the character with a heavy physicality that reeks of menace and complexity. All deliver committed performances that bring to life their characters and it is never more so evident that when the fighting happens. There are too many highlights to name but fans of the films will be pleased to know that the smoulderingly handsome and mysterious Hajime Saito (played brilliantly by Eguchi) gets involved with more street scraps where he swaggers down boulevards set ablaze with a cigarette clamped between his teeth whilst dispatching multiple bad guys with precision strikes without missing a beat. The fight choreography is pulse quickening stuff as the characters use their environments with skill and fight with a mixture of ingenuity and technique. All of those historically accurate (to my eye, at least) sets get demolished and the environment is heavily affected as people get thrown through doors, books and lanterns are tossed at opponents to buy a few vital seconds of breathing space so they can work themselves into better positions. Power is conveyed through the speed of the flurries of kicks and punches and the reactions of opponents and in a neat bit of detail you can see props blown about for dramatic effect. The highlights are many and culminate in a massive battle when Kyoto is set ablaze. Watching all of these performers is thrilling beyond words, real edge of your seat stuff as they display athletic prowess that are exciting. The bursts of speed are kept on frame so we see the swift and well-defined and precise movements. We never lose track of the fighters or what they are doing even amidst the humongous battles full of what seems like hundreds of extras which, again, brings up the history of Japan because the showdown in Kyoto feels epic. This is a battle not just for Kenshin and his friends but for all of Japan as young and old, men and women, all take part and all get a moment to shine as their individual battles are expertly intercut together to give a sense of the action. Far from being sucked out of the action, we are firmly placed in it, the mise-en-scene and actors flawlessly combined to create an exciting arena filled with combatants who are larger than life as in the manga, and yet totally believable. There is an energy and attitude to the precisely orchestrated battles that, when coupled with the stateliness of the drama brings home the high stakes game being played by the characters. Everything is performed and filmed with the precision of a Swiss watch, no shot or sequence wasted, everything feeding into telling the audience what they need to know about Kenshin’s times, his personality, and the battles he faces to bring about peace in a new age. Overall, Kyoto Inferno is a beautiful and flashy action film with a brain and a heart. It’s full of fun, colourful, and compelling characters brought to life by passionate actors who work together in a story which has a rock solid tightly plotted script that draws on real history to create a fascinating and engaging sweeping historical action film. The production team have adapted an exciting comic-book version of Japanese history and the details are almost palpable to such an extent that it is easy to feel transported back in time and with some artistic license it makes real the drama of the seismic shifts experienced by society in Japan. Overall, the first two Rurouni Kenshin films are some of the best action films in recent cinema and definitely some of the most accessible chanbara films available both in Japan and elsewhere and I thought Kyoto Inferno was one of the best films I saw in 2014! BRING ON THE THIRD FILM! 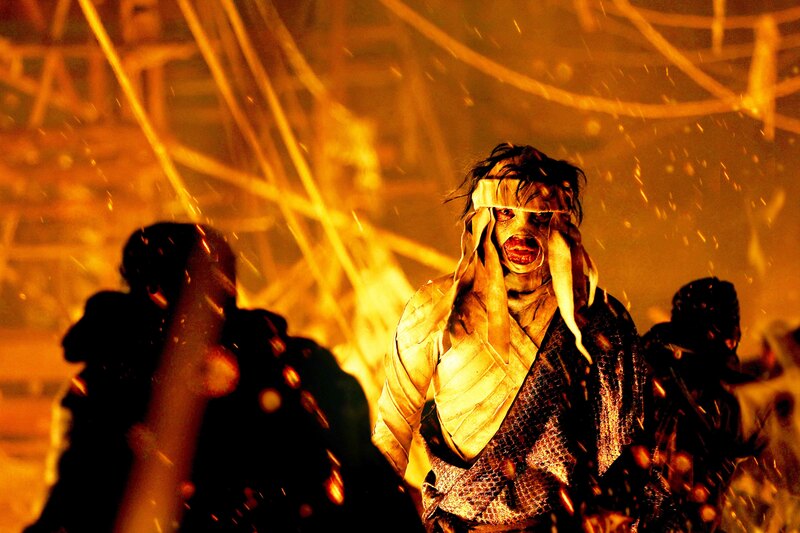 The third film, Rurouni Kenshin: The Legend Ends is released in the UK on April 17th, 2015. Here’s the original Japanese poster for Kyoto Inferno. That does look pretty awesome to be honest! Will have to see it! It is tremendous fun! It’s getting a DVD/Blu-ray release in April just before the third Rurouni Kenshin film gets a theatrical release! Both this and the prior movie were awesome films. The fights were excellent and most employed real techniques. Kenshin crossing his forearms as he intercepts attacks when fighting unarmed actually has parallels in Historical European martial arts, which was interesting to see. Though, I did notice that many of the armed small fry attacked in false time (legs moving forward first) instead of true time (hands moving to sword before the body follows), but this might be due to them being poor swordsmen. I’m also very much looking forward to the third movie. I do have a few quibbles about certain choices for the cast, but otherwise this is a great adaptation. I especially loved how they tied so many different story arcs together so smoothly in the first movie. And the scene of the assassination Kenshin accomplished during the revolution struck me as so similar to the one in Trust and Betrayal that it blew my mind! The fights are one of the best aspects of the film. They seem so simple and quick and one can breeze past them with simple enjoyment but watching them reveals that the choreography is very complex and that a lot of thought has been put into how the set/camera work can be used to show off how dangerous and deadly these characters are. I go back and watch these scenes, the fighters, their surroundings, and I’m impressed by all of the effort and detail. Full marks for all the actors, even if they did get trounced in a few seconds by Takeru Sato. I agree on everything you said. Takeru is the centre of this movie and it makes me admire him more as he did all the fighting and stunt by himself. Ps. you need to correct this: ” Ryunosuke Kamiki, an excellent new actor from Japan” Kamiki has been an actor long before Takeru. He has been in TV and Movies since he was 2 years old. I am planning to write about him but I still have no time to do it yet. When I saw him as Soujiro, I know I have seen him somehow and when I looked it up, I had seen him when he was 7 years old…such a cute little boy. I think Sato put in an excellent emotional performance that’s easy to miss considering the tremendous physical performance he does. Point taken on Kamiki. He’s certainly new to me since I only discovered him when watching The Kirishima Thing. I don’t think anyone miss that. That’s the main reason why I am now his fan. The physical performance is a bonus to his perfect portrayal of Kenshin. Yeah, I wanted to emphasise the growth in Takeru’s acting ability because some people dismiss him as nothing more than a pretty face/idol. I think this performance shows a lot more range than we’ve seen in other films so I wanted to point it out. I’ve been wanting to see this. I enjoyed the first film a ton!